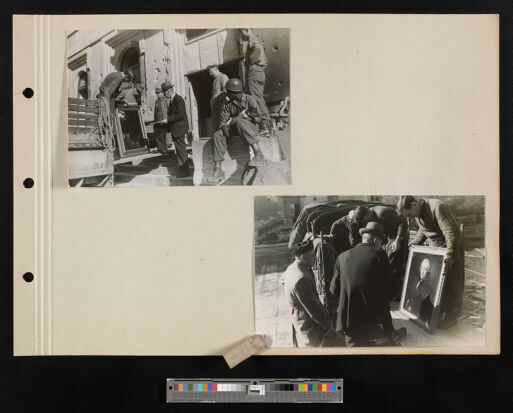 Digital Surrogates from the Edwin C. Rae Papers contain digitized pictures, albums, correspondence, certificates, catalogs, reports, and magazines related with the restoration and preservation of art and architecture pieces in Germany after World War II. Materials are related with distinctions received by Mr. Edwin C. Rae for his important contribution as Chief of Monuments, Fine Arts and Archives Section, at the Office of Military Government for Bavaria (Germany). Edwin C. Rae was an American specialist at Central Collecting Point, a depot used by the Monuments, Fine Arts, and Archives program after the end of the Second World War. Materials also include a digitized copy of of Heute, a specialized illustrated art magazine (Number 9, April 1946); a handwritten music sheet; a handwritten diary, entitled "Moments, Fine Arts and Archives Work, Diary" (1945-1947, 1958) and a handwritten note with a food listings entitled "Train Special, 22. XII. 45, Wein - Budapest". The Edwin C. Rae Papers (Digital Surrogates), 1945-1947, 1958 are managed by the University of Illinois Archives and do not feature precise descriptive information for each item. Discover their contents by browsing the folders and files. For more information, contact an archivist at illiarch@illinois.edu.